Whenever I have the luxury of time, I normally browse through the updates of my Facebook friends' list. This for me is a source of status how my closest friends are doing lately and admittedly, this is also the best source of laugh on tiresome days. 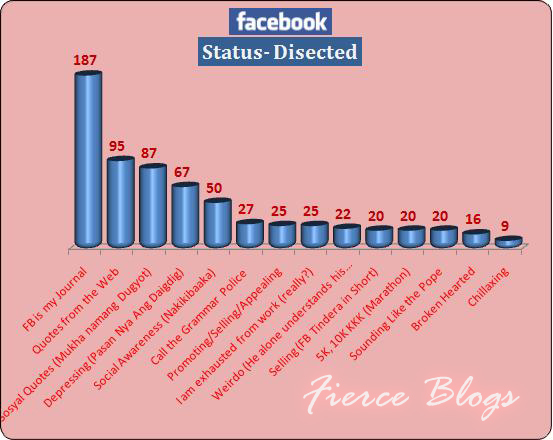 Let's have fun on Fierce Blogs today! 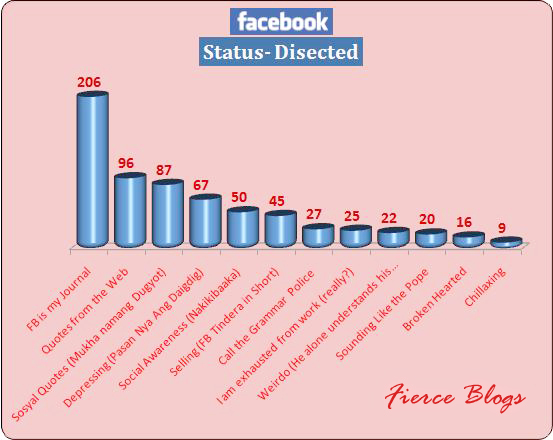 Based on 670 Facebook Status Samples, Fierce Blogs tried (the best it can!) to classify them into 12 categories. FB Is My Journal - These are the type of Facebookers who report to everybody what they do (and did): daily & by the hour. In short, they FLOOD THE WALL with endless updates on: what they do, what they are eating, music they are currently listening to, where they are, where they are going, who they are with and even broadcast to the world their love lives. FB status for them is like updating their journal where everybody can feast on. Quotes From The Web - I can only imagine how much time they devout looking for an appropriate quote they have in mind. They painstakingly surf the net until their eyes bleed and pop out. There are those occasional users also who use famous song lyrics to describe their current state. 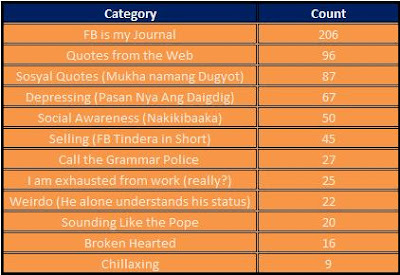 Sosyal Quotes (Mukha Namang Dugyot) - I think this category is self-explanatory. But if you will insist for its description, ok fine! They bombard the wall with "sosyal updates"! Problem is.. mejo indi bagay sa kanila (it does not quite fit their personality). Depressing (Pasan Nya Ang Daigdig) - We all go through tough moments in life. It is rather sad that others would like to showcase how depressing their current state is. You want a sample? "I feel so alone and nobody is texting me" or "Nobody loves me" and a lot more depressing updates. I mean, if you want company (we all do), call your friends and meet up with them. Don't appear like a dilapidated foot rug that was thrown into the drainage. There would never be dignity doing this! Social Awareness (Nakikibaka) - Their updates sound like politicians pleading to get a single vote from their network. Not my trip... Next category please! 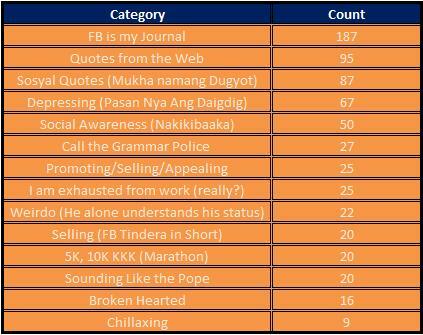 Selling (FB Tindera In Short) - Before Facebook, there was Multiply. I think the biggest reason why Multiply is no longer a preferred Social Site is because of the tremendous selling involved left and right. I mean, if I want to buy products , I would not be even thinking of Facebook or Multiply.,I go for Ebay! Call the Grammar Police - Wag kayong plastic at aminin na natatawa rin kayo dito! (Admit it! Reading these posts also make you laugh!). Are we being mean? Hmm I don't think so! Call the Grammar Police category is just funny! Really, really funny! I Am Exhausted From Work (Really?) - They get a high posting on their walls how hard they work the whole day and how good of a worker they are. Reminder: The Facebook Wall Update is not a source of data for your annual evaluation - at least not now! Woot! Weirdo (He Alone Understands His Status) - He alone knows the meaning of this status and is not willing to share to anybody what it means. I mean, what the point of sharing, right? Weirdos! Sounding Like the Pope -They preach to everyone! Amen! I guess this category is neutral and in the middle ground for everyone. Not all the time, though. Brokenhearted - They shout to the whole FB world that the boyfriend slept around etc. Again, leave a little something for yourself - It's called privacy. Drama Queen is so 5 years ago! Chillaxing - Of all the updates, this the one that is nice to see. Cool and pleasant. No drama! Sadly, very few people has his status update. May be a lot are in a depressed mode nowadays. Kapal ng mukha ng blogger! Feeling! Cheh! At indi ako guilty! Ewan sayo! I enjoyed this blog and shared it to my friends here in Netherlands. I RSS your blog site. Finally naka visit din ako sa blog site mo. Palaban tong blog na to ah. Congrats Erik. I heard you got nominate as one of the emerging blog for 2010.